I am starting to flex my writing muscles again. I'm looking and (re)looking at books on the craft of writing. Many writers believe that writing benefits from exercise and practice like many endeavours in life. I think that is true. Writers need to write. I also believe you need to read. If you read a lot and write a lot, you will find yourself a writer-reader. Your craft and writing will improve. Maybe you will go on to be published. When I first started writing in my early 20s (or maybe even earlier as a teenager), I rushed through the rules of grammar and sentence. I stopped by structure which fascinated me then as it fascinates me now. I was in a rush to write in the here and now and not to spend too long on the shoulders of the greats and the classics. Now I'm older and I'm finding much to interest me in older work, perhaps as I've not had a chance to engage with as much current writing. My wonderful early training by Adrienne Kennedy and Forrest Gander pushed my curiousity and left me in a sense of wonderment that I could write about anything and everything I wanted - that a studied understanding of words, language, sound, rhythms and the like would propel me on. I am out of practice. On plus side, I'm richer in life experience. I've read more. (Although perhaps too many of the business and academic books Ursula Le Guin and Forrest would despair of). I've had time to absorb more thinking on the classical, so I can be more sure of the rules I must break, the rules I can break and the rules I break accidently. I'm back in training. I've been reading some of Le Guin's non-fiction work and her call for literature as an operating manual for life. 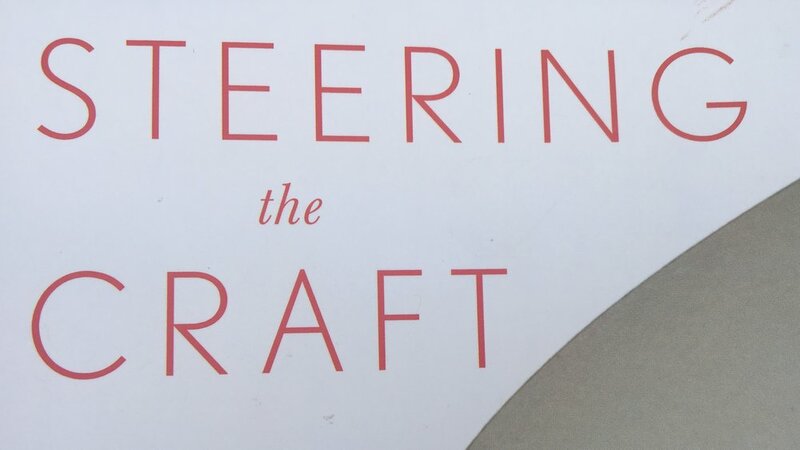 She offers provoking thoughts and useful exercises on narrative story telling in her book, Steering the Craft. I extract these thoughts from the book. I feel the book has excellent exercises for story telling. A touch less relevant for play and script writing (or poetry) which has its own structure but narrative is narrative and writing is writing. I'm not going to discuss writing as self-expression, as therapy, or as a spiritual adventure. It can be all of those things, but first of all - and in the end to - it is an art, a craft, a making. And that is the joy of it. To make something well is to give yourself to it. to seek wholeness, to follow spirit. To learn to make something well can take your whole life. It's worth it. Whether you write fiction or non - narrative is narrative. Most writing classes or courses in school focus on expository writing, giving information, explaining. They talk about "expressing ideas" but not about story telling. Some of the techniques and values of expository waiting are irrelevant and even problematic in narrative writing; training in the elaborately irresponsible language of bureaucracy or the artificially impersonal language of technology and science can tongue-tie a storyteller. Since narrative is what this is all about, try to make each exercise not a static scene but the account of an act or action, something happening. It doesn't have to be bang-pow "action"... what it has to do is move - end up in a different place from where it started. That's what narrative does. It goes. It moves. Story is change." I will leave you with an exercise crucial for all writers. I don't know a single playwright who had never had to cut in order to hone her work. It is true of plays, poems and stories everywhere. Chekhov advocated it as well and his work both plays and short stories have stood the test of time. Cross fertilise. Read about the autistic mind here and ideas on the arts here. On investing try a thought on stock valuations or Ray Dalio on populism and politics.